The Flying Spur name was first used on the Mulliner-bodied Continental saloons of the 1950s, and for the past 10 years the moniker has been used once more on 4-door Continentals. The 2006-13 Continental Flying Spur was essentially a stretched 4-door version of the Continental GT, and while the redesign that came in 2014 is still heavily related to the Continental GT, the model is now known simply as the Flying Spur. Changes don’t come quickly at Bentley, so don’t expect anything revolutionary for 2017. A big addition, though, is a V8 S trim that was introduced in Geneva this year. This S adds power and tightens up the suspension for better handling, while distinguishing features on the outside include a blackout grille, rear diffuser, and wheels as well as dark-tinted exterior lights and two-tone leather for the interior. The standard V8 AWD Flying Spur is still extremely expensive and exclusive, at $200,000, and it’s got bags of performance, despite being a massive 5,500-lb luxury barge. The 4.0-liter V8 is borrowed from Audi and makes 500 hp and 487 lb-ft of torque, enough to scoot to 60 mph in 4.9 seconds and on to a 183-mph top speed. The new V8 S, meanwhile, ups power to 521 hp and 502 lb-ft and correspondingly drops the 0-60 time to 4.6 seconds and raises top speed to 190 mph. The big money, however, will go for the range-topping W12 trim. While it’s actually only 20 grand more expensive than the standard V8 trim, the W12 has 616 hp and 590 lb-ft of torque. Directing power to all four wheels through an 8-speed automatic, the W12 Flying Spur will get to 60 in 4.3 seconds, on the way to to 200 mph. Obviously, a car with this many cylinders firing and this many pounds to lug around isn’t going to be frugal when it comes to fuel. Even with cylinder deactivation, the 8-cylinder cars only manage 14 mpg city/24 highway/17 combined. The W12, which weighs 300 lbs more, will do 12/20/15. While the Flying Spur is certainly fast in a straight line, it’s also quicker on its feet than it looks--even if it isn’t exactly a Porsche--and the new S has reworked damping and stability control systems that stiffen things up and allow the driver to get a little more squirrely in the corners. Ceramic brakes are also optional on the S, and adaptive dampers are standard on all Flying Spurs. The torque bias on the all-wheel-drive system is 40/60, although it can shift 65% to the front or 85% to the rear depending on conditions. It’s not always easy to see why Bentleys are so expensive, but when you get inside one it starts to make sense, as that’s where all that hand-built English extravagance is at its best. The fit and finish for the 2017 Flying Spur are of course top notch, and with the range of trim and color choices available, it’s easy to personalize your car to a certain degree. All seats are heated and ventilated as well as 14-way power-adjustable with memory settings. Infotainment, meanwhile, is centered on a large LCD screen that can even be operated by rear seat passengers via a remote control. Not that rear passengers will worry much about what’s going on up front, as there are 10-inch flatscreens in the back of the front seats to keep them entertained. For audiophiles, a Naim 1,100-watt audio system is an available option, while the Mulliner Driving Specification package adds yet another level of class with diamond-pattern quilted seats, drilled alloy pedals, a knurled shifter, a jeweled filler cap, and two-piece alloy wheels measuring 20 or 21 inches. The new S trim also adds some personality to the interior with Piano Black wood veneers and two-tone leather upholstery. Very expensive cars like the Flying Spur don’t typically get crash tested, but the sheer mass of this Bentley will keep its occupants okay in most crashes, and these cars are typically driven carefully. While the Flying Spur doesn’t have the suite of high-tech safety features that most new cars on the road today seem to have, it does offer a reassuring number of front and rear airbags as well as traction and stability control. Still as much a status symbol and sign of success as it’s always been, the current Flying Spur range is entering its third year. There’s a new performance-oriented submodel, but overall, Bentley remains one of the top names in ultra-luxury cars, albeit with a bit more liveliness for the driving enthusiast than the equivalent Rolls-Royce. 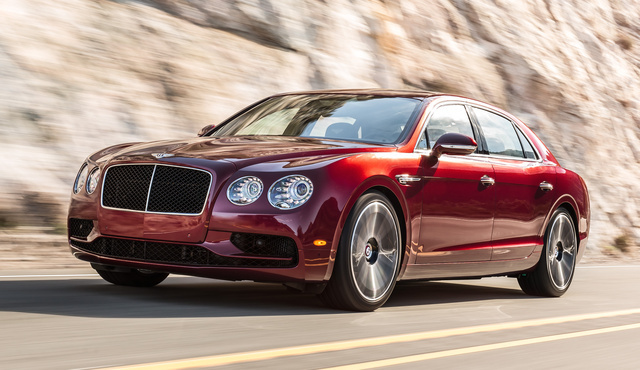 What's your take on the 2017 Bentley Flying Spur? Have you driven a 2017 Bentley Flying Spur?